To be given the designation, a car must feature standard electronic stability control and obtain the top “good” ratings in front, rear, rollover and side impact evaluations. 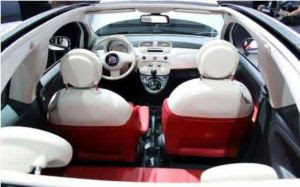 This designation applies to Fiat 500s created after July this year, when the structure of the driver’s seat was modified to boost occupant safety in rear-end and frontal crashes. The Fiat 500 joins Ford Fiesta as the only minicars to be named “Top Safety Pick,” said the IIHS.